What exactly is a cache? 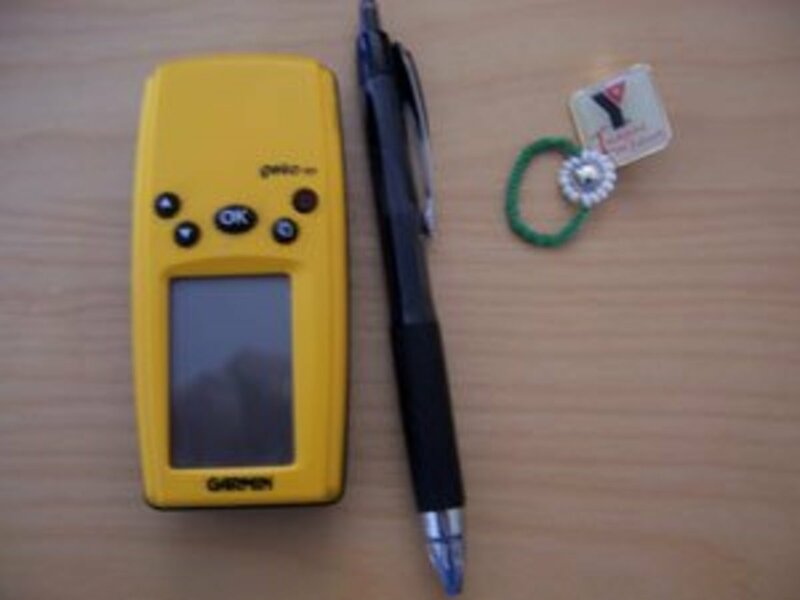 Geocaching (GEE-oh-cash-ing) is a great outdoors recreational activity that's similar to a scavenger hunt. There is a hidden object, and you're given clues and GPS (global positioning) coordinates to help you find it. It's incredibly fun, and becoming more and more popular every day. I began geocaching about 2 years ago and have since found well over a dozen geocaches all over California (including San Francisco, Oakland, Napa/Sonoma, and Southern California). It's a great way to explore an area, even places you're convinced you know very well. People leaving geocaches almost always leave them in intriguing places that they'd like to share with inquisitive, curious people like other geocachers. Best of all, it's very easy to do for a beginning novice. You only need a few things to get you started. 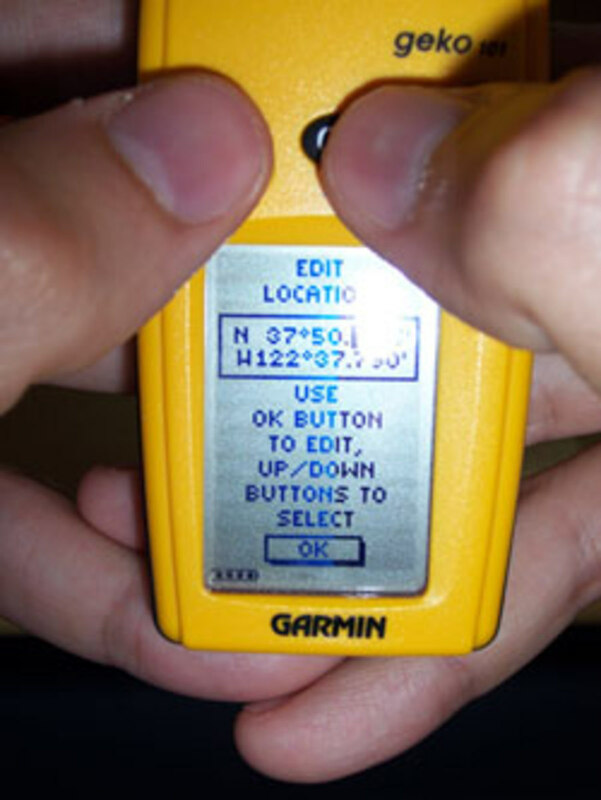 a GPS receiver or GPS-enabled smartphone. 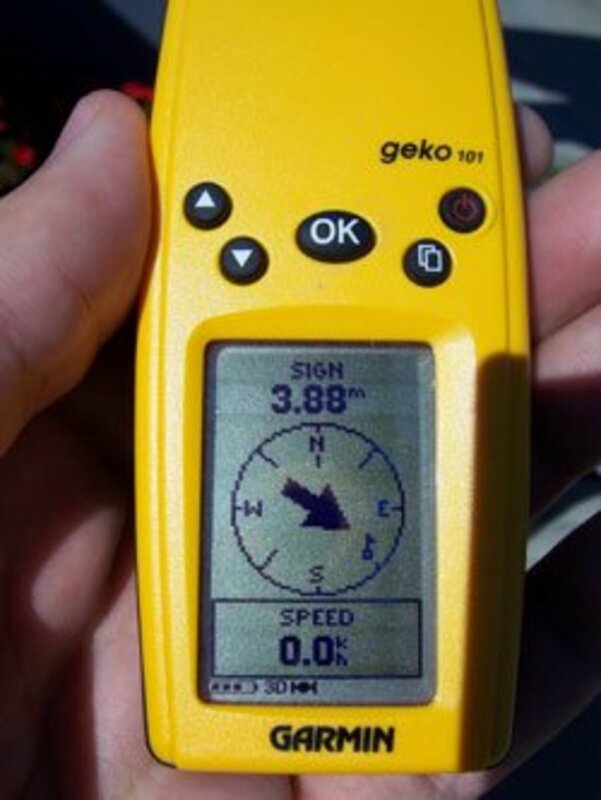 GPS receivers can be bought for about $100 these days (probably even less used). Garmin and TomTom are the most popular brand of GPS receivers. 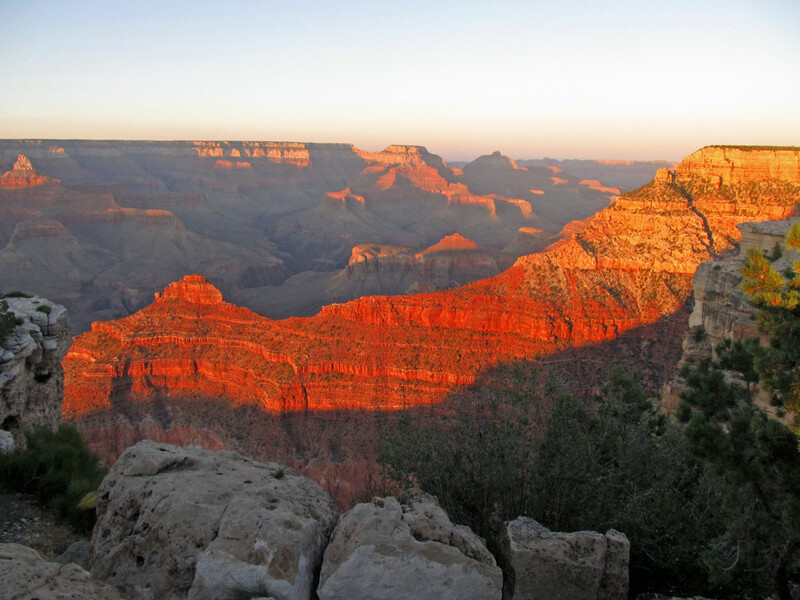 Low-end ones are monochrome with limited functionality; high-end ones are in full-color with added features such as 3-D maps and the ability to store your entire trip. a pen or pencil. So you can leave a note in the cache to the cache owner. a small trinket. There's a tradition among some geocaches to take a trinket out, and put a new one in. That way, the geocache has some "life" and changes continually over time. You also get something from a stranger, and give something to another stranger. Full listing of nearby caches, closest ones first. This part is easy. 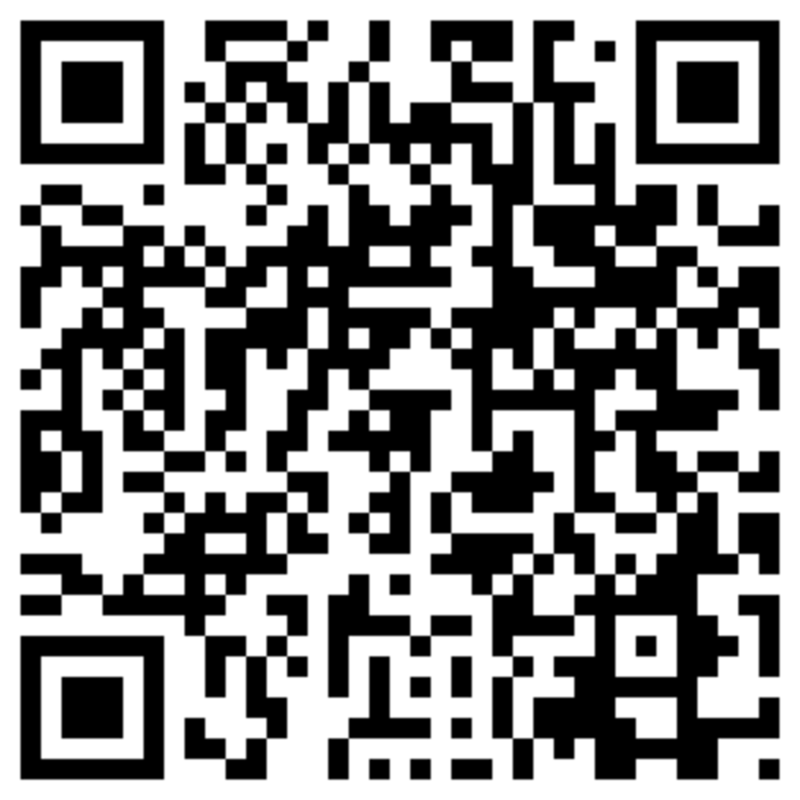 Go to Geocaching.com and in the upper-right corner, put in your ZIP code (if you're in the US), or select your country. when it was last found by someone. This is always cool because some were just found and logged a few hours or days ago; others have been dormant for months. Pick a cache and click on the link to get some more information you'll need. Find a cache that's as close as you'd like (or willing to walk, bike or drive to), with the level of difficulty you're looking for, and click on the link for more information. You'll find several things on this page (register for Geocaching for free first - trust me, they don't spam you and don't make you pay for these basic services). a log of previous geocachers' notes after finding the cache. It is usually full of spoilers, so don't look at this section until you've found the cache and want to report something to the community. You can either print out the entire page, or scribble down what you need to know on a piece of paper and take that with you. 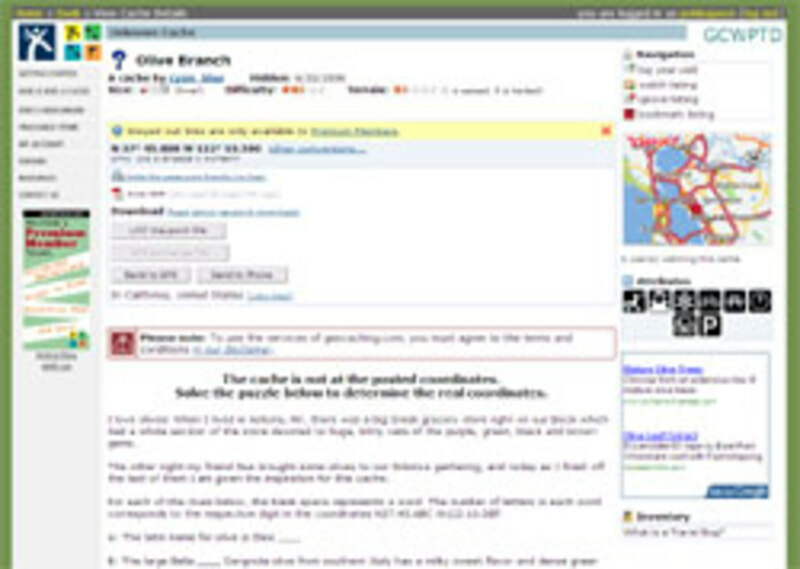 This page will give you all the information you'll need to have to find your cache. 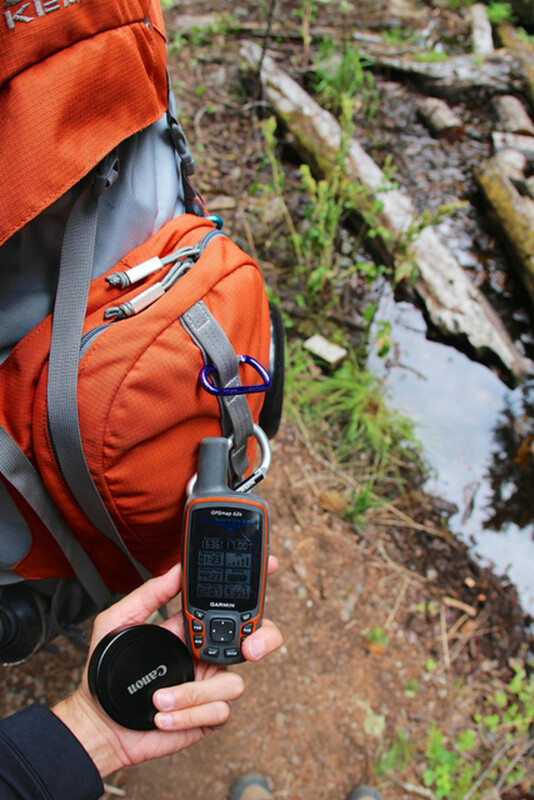 Follow the instructions of your GPS receiver to enter a new waypoint (a specific location with coordinates) with the cache's coordinates. Believe it or not, those coordinates are specific enough to typically get you within 10 feet of the cache! Double check the numbers to be 100% sure they're right--you don't want to be searching for a cache miles away from where you should! Speed is 0.0 because I stopped to take this picture. But you can see I need to head SE, and walk another 4 m or so. In your GPS receiver, choose this new waypoint you've entered, and GOTO. Then, go outside, away from tall buildings, and wait for your receiver to get strong signals from the GPS satellites circling the earth. This can take anywhere from a minute to five minutes. You will typically not be able to get a signal inside buildings or between skyscrapers. Once you've gotten strong signals and hit GOTO, the GPS receiver will tell you which direction to start heading and how far away your target is. Start walking! (or driving, depending on how far you are) The GPS receiver is remarkably good at telling you where you're supposed to go, and even how fast you're going. A cache surreptitiously hidden behind a metal sign, using a magnet. 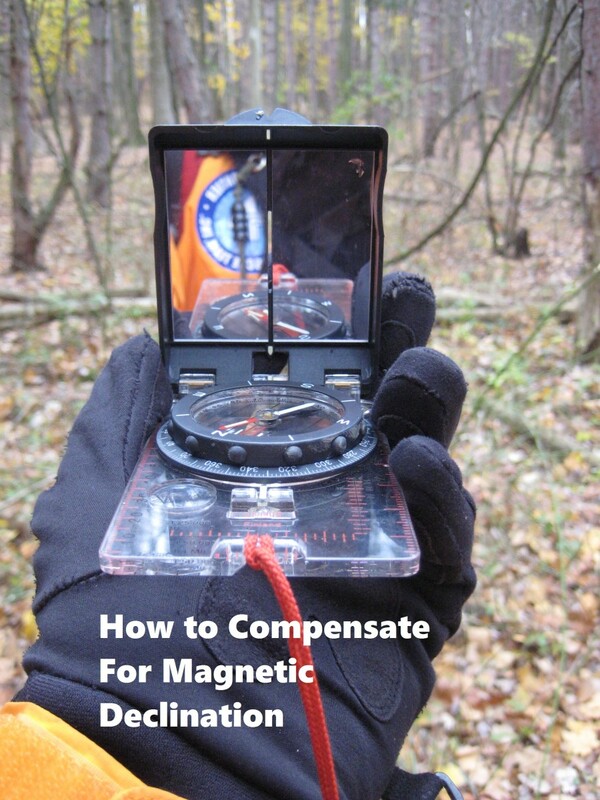 When you get within 10-20 feet of the cache, the GPS's resolution will not be good enough to help you any further. It just puts you in a 20 foot circle of where you need to look. Now you need to use the clues and your intuition to find the cache. Keep in mind that the cache might be above you or below you. We found on cache in Union Square in San Francisco and after looking around the Christmas tree there for a good 20 minutes, we realized it could be under us, and took the elevator down to the parking garage below us! This little stapled log has room for thousands of short entries. Be sure to leave yours! 6. Open up the cache! Open up the cache carefully, and take a look inside! There might some other small trinkets. 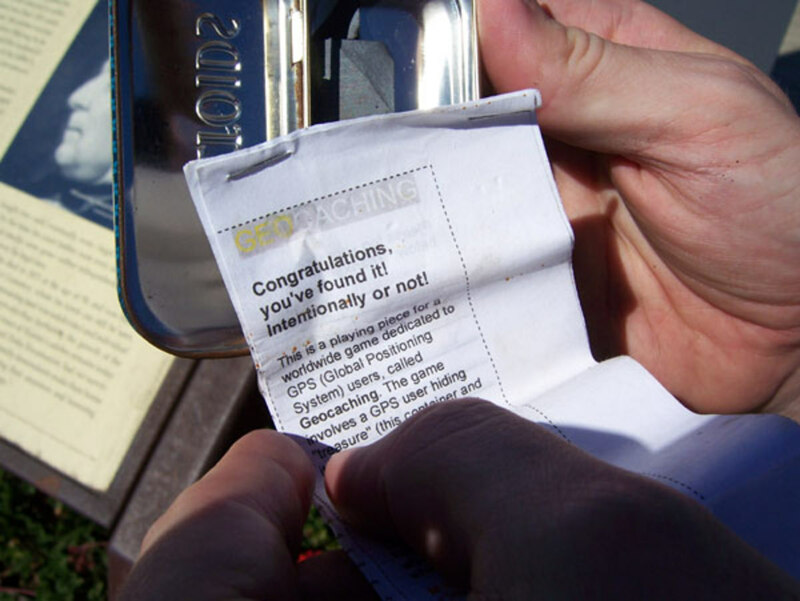 If you've brought one of your own, you can leave it inside, and take another one as a memento of your cache. You should go back to the Geocaching site later, and leave feedback to the cache owner in the (Web) cache log, who typically checks it often. 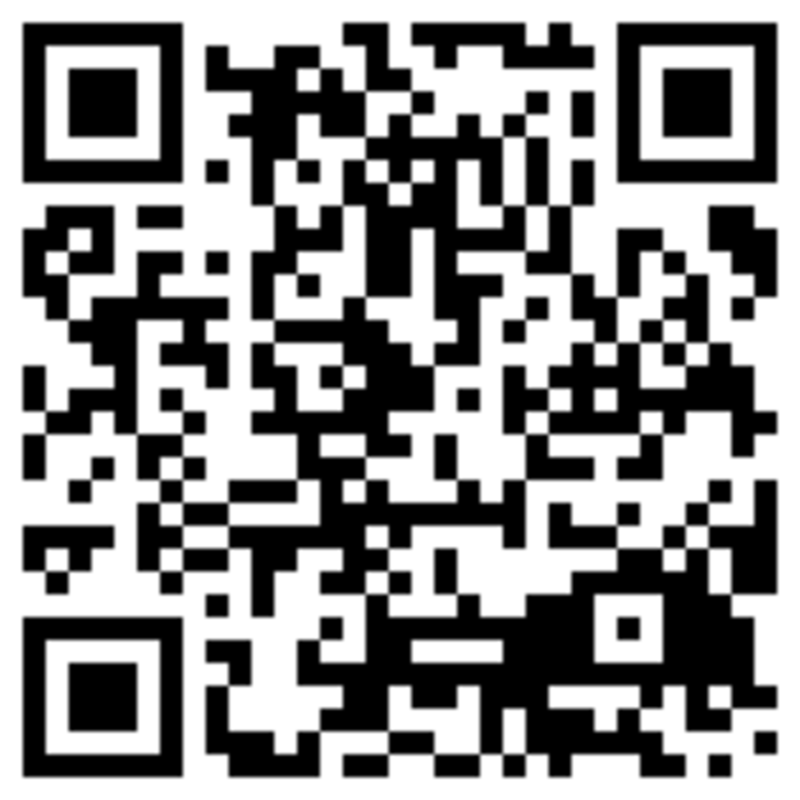 Geocoins are custom-made coins that you can leave in caches that you find. The idea is that your coin will travel from cache to cache over time, as people who find the cache take it out and put it in their next cache. Then they log where the coin has been left, allowing you to track where your coin has gone. Say you left your own geocoin, with its own serial number, in a cache in Tempe, Arizona. Then, someone finds that same cache a week later, and takes it out. He then puts it in the next cache he finds in El Paso, Texas. 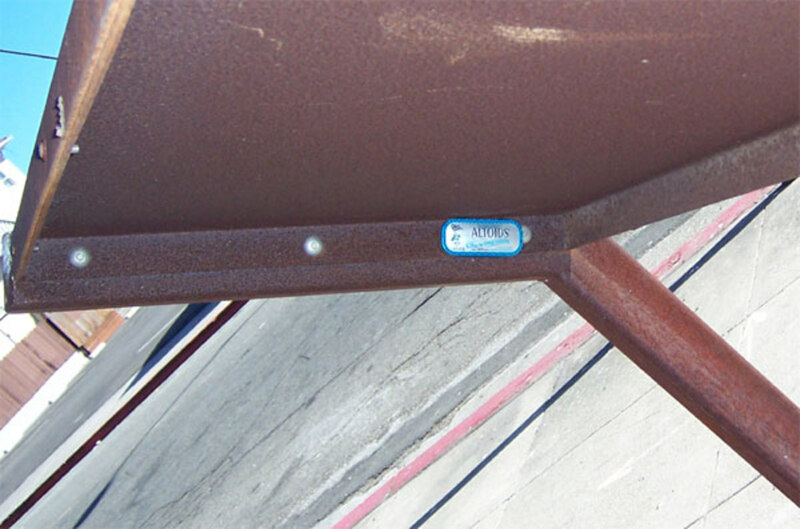 If he plays by the "geocoin rules", then he'll go to the geocoin Website, look up the coin by its serial number, and register that it is now in a cache in El Paso. You, then, could do a search on your serial number, and see that the coin you left in Tempe has now transported itself across a couple of state lines to the east, in Texas! There are several companies that sell geocoins. The concept is very similar to Where's George, which tracks dollar bills as they change hands through normal cash transactions. 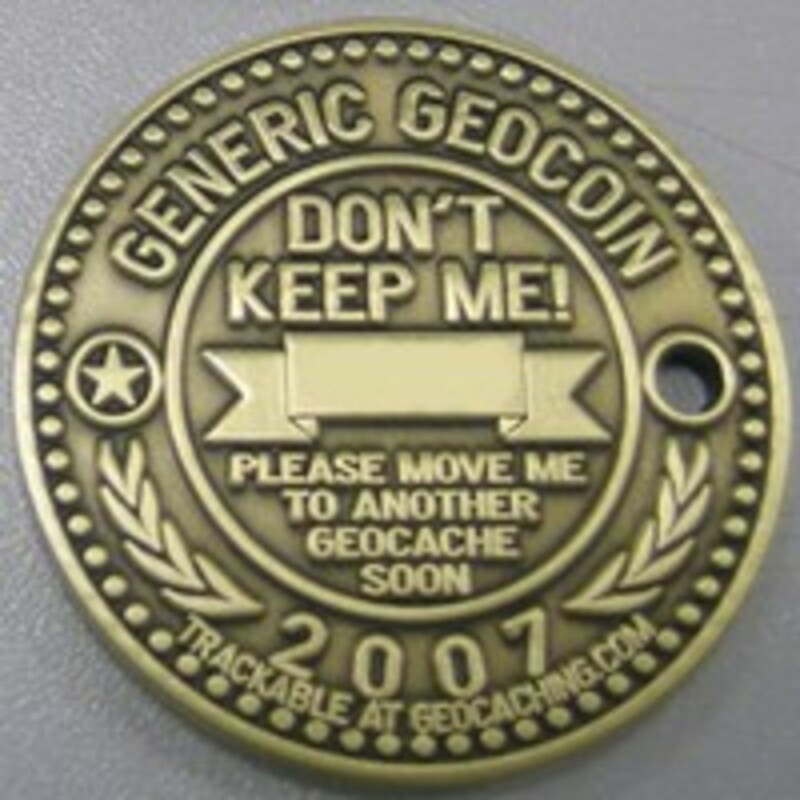 Not designed to be kept, geocoins should hop from geocache to geocache. I love geocaching! I have 3 hides and 175 finds so far. I'm ready to start! Thank you! Great hub! 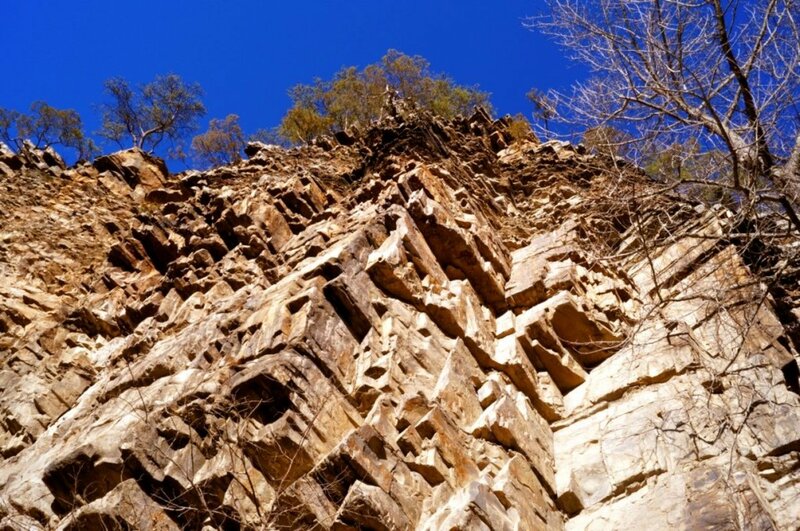 I'm sure that its gotten many people started in geoacaching. I have only heard of this hobby in recent months, and I am truly intrigued. I am looking forward to spring so I can get started. Sounds like fun for children as well. A lot of people are doing this around here. One of the places that Jennyjenny and I wrote about, McCourtie Park is a geocache site. It is also known for being haunted. I know a group of women who do Letter-Boxing and that is where one of their geocache sites are. They went looking for the cache in the evening and took some interesting pictures that night. They got orbs, spirit lights, and ectoplasm pictures. This sounds like so much fun! 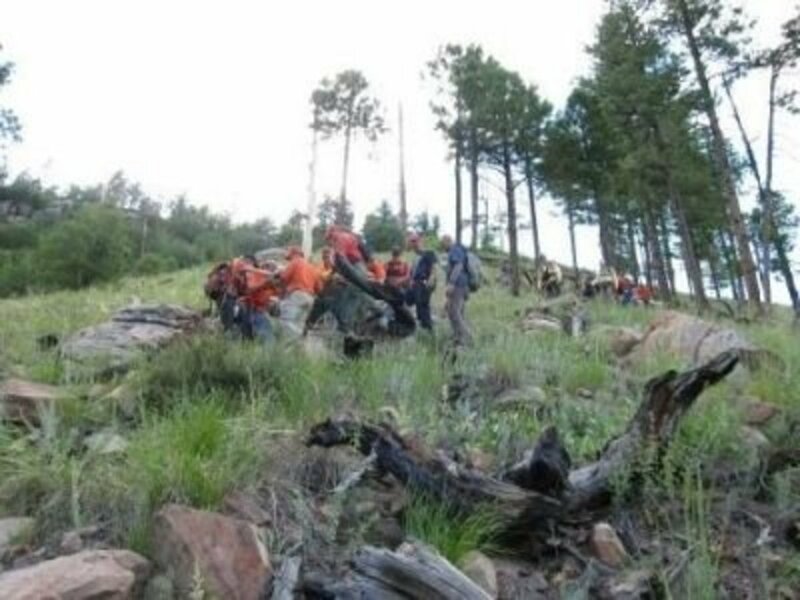 I'm going to try it with my scout troop! Thanks for sharing! I just started doing this today! While out and about on a shopping trip with some girlfriends. It was SO MUCH FUN. We're hooked. Here's a blog post that I wrote about our experience finding our first ever cache! I've been wanting to take my family Geocaching but thought it was more complicated than it actually is! I read many geocache sites throughout the past year, but it still wasn't clear to me. I just found your site on Yahoo! Thank you for taking the time to put it up. It helped me tremendously. I think we are ready to give it a go! What a great way to bring families together in a healthy, fun, way! I will be sure to keep you posted on our geocache experience! Thanks Again!! Great hub. I have just discovered geocaching this week and already have found 4 caches. I am enjoying this new hobby very much and started writing about it too. I want to get a handheld gps like the one you have pictured, but for now I amusing my Garmin Forerunner 305, which is a running watch equipped with gps.... it works great. Wanted to find out if anyone was aware service to set up a Geocache birthday party. Daughter 10 years old loves geocaching ... feel that this would be a lot of fun for her and girlfriends. Thanks for any info. I have been geocaching for seveal years now with my family. It is a fun activity we can do together and a fun treasure hunt of sorts. I recommend it to lots of families and we even incorporate it into our summer vacations when we travel to other states. Thanks for the guide, I just put up my own intro to Geocaching too. Love the sport! Great post for people starting off. Thank you wajay_47. It is a lot of fun, but be prepared for people staring at you quizzically as you dig through brush, look behind signs, etc. Last week, a woman asked us we had lost our keys. Livelonger, great hub. 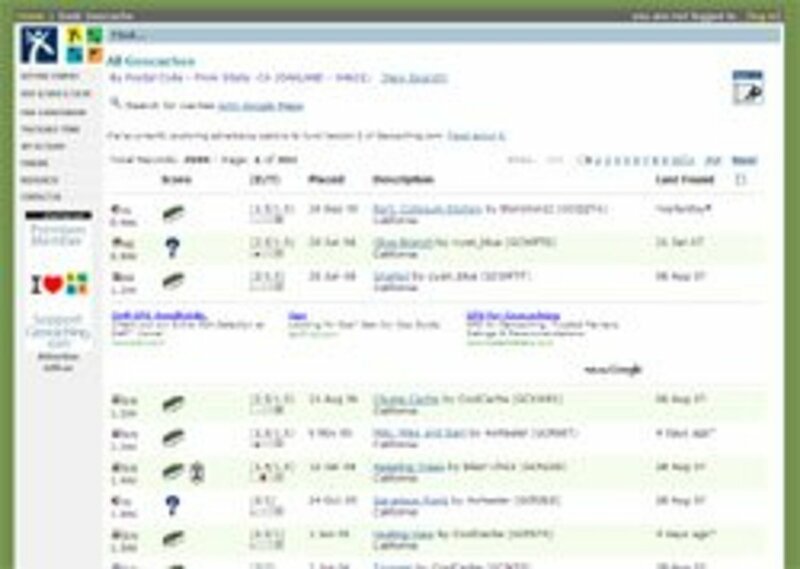 I just did some research on geocaching and hope to be trying it soon. Sounds like great fun. This is catching on all over. Great hub. It's gotten more and more popular, especially as GPS receivers get cheaper (more &amp; more mobile phones have them) and as more caches get hidden. There are about a dozen within a 20-minute walk of our apartment.